Golden Bean Hotel has been awarded the Best 3 Star Hotel at the just ended 2017 Regional Tourism Awards organized by the Ghana Tourism Authority, Ashanti Region. 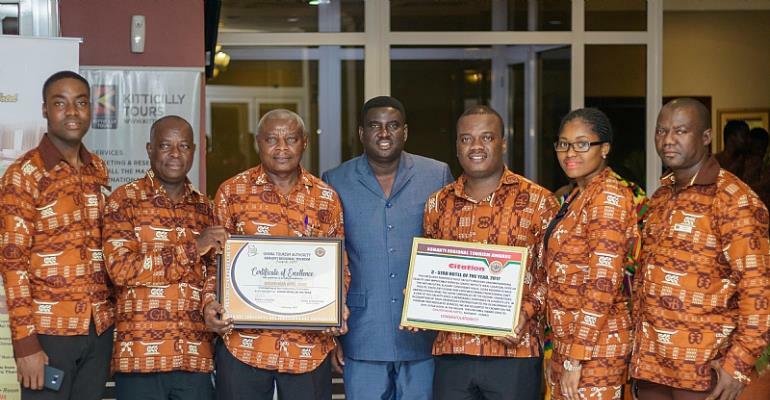 Barely a month after being adjudged the best 3 Star Hotel in Ghana at the 2017 Ghana Hotel Awards, Golden Bean Hotel has again been crowned the Best 3 Star Hotel in Kumasi. The hotel facility picked up the ultimate award at the 2017 Regional Tourism Awards ceremony held on Friday February 23 2018 on its premises under the theme, "Promoting responsible tourism". "This makes us feel very proud but means we shouldn't end there. We have to strive to do better. Being at the top means we need to maintain our standards and quality. Just as our tagline states, Hospitality beyond expectations, we would explore our clients to expect more value for their money". This adds up to the number of awards received by the hotel since its establishment in 2014. In 2015, Golden Bean Hotel was awarded Consistency in Payment of Tourism Levy by Ghana Tourism Authority “ Ashanti Region. It was again awarded Top Quality Emerging Hotel Brand in Customer Care and Comfort by Top Brands Ghana same year. In 2016, Golden Bean Hotel continued its exploits bagging four distinctive awards including Three (3) Star Hotel of the Year “ Ashanti Region, Gold Award (Hospitality) “ 8th Ghana Business and Financial Services Excellence Awards, Outstanding Hotel of the Year “ Achievers Awards awarded by the West African Regional Magazine, Fastest Growing Hotel of the Year by Cenba Business Excellence Awards and Three (3) Star Hotel of the Year “ National Tourism Awards by Ghana Tourism Authority. Named after the cocoa bean that has fuelled Ghana’s economy for close a century, the hotel features original sculptures and artwork that pays homage. Inside the hotel, the understated colours of chocolate-brown and gold are seen throughout. The Golden Bean Hotel is a stylish hotel close to the heart of Kumasi. Offering 51 rooms in four different configurations, the Golden Bean is small enough to give personal attention to every guest, and yet large enough to cater for up to 1000 people either as a banquet, conference or any other event. The hotel features a restaurant, a patisserie and inside bar with two additional bars outside by the swimming pool and the immaculate gardens. There is a fully equipped gym on site. Each room is en suite with wifi, LED TVs, personal safe, large wardrobe and comfortable beds. There are four different room types so there is bound to be the right room for you, whether it is a honeymoon suite, family room with interconnecting doors, universal access compliant or one with an outdoor balcony. Throwing light on the criteria for the selection of award winners, Regional Manager of Ghana Tourism Authority, Mr. Peter Acheampong said, the criteria included ideal location, excellent facilities and services, excellent cuisine, splendid and spectacular views, interesting sporting and recreational facilities, professional management and high cleaning standards. He again said winners had also fulfilled their statutory obligations such as payment of 1% tourism levy, VAT, SNIT contribution by the establishments. Mr. Peter Acheampong appealed to curators of museums and managers of tourist sites to provide discounts for members of various tourist clubs, students, to enable them patronise attraction sites regularly. Present at the awards ceremony were high-profile dignitaries including Mr. Osei Assibey (Mayor of Kumasi), Nana Baffour Agye Kesse (Adumhene), Mr. Peter Acheampong (Regional Manager, Ghana Tourism Authority), Mr. Alex Boakye, and many others. In all, 31 awards were presented to various tourism practitioners in the region at the colourful ceremony.